The Hazara are a people of distinctions - set apart from fellow Afghans by religion, mixed ethnicity and an independent nature - and they have suffered for them. Persecution has shaped and defined the Hazara, particularly over the last 200 years. They face discrimination as Shi'ite Muslims, a minority among Afghanistan's dominant Sunni Muslims, as well as for ethnic bias. 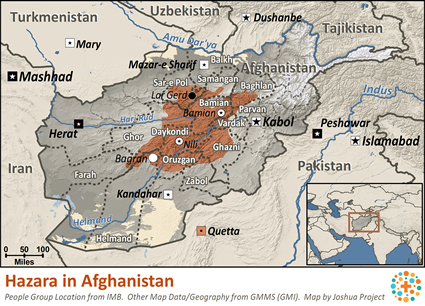 Pre-second century inhabitants, they are likely Afghanistan's oldest. Their traditional homeland lies in central Afghanistan amid rugged mountains - a wildly beautiful, nearly inaccessible region of craggy peaks and rushing rivers called the Hazarajat. Hazara origins are much debated. Their name is from a Persian word meaning "thousand". Current theory - supported by obvious Asian features - favors descent from Mongol soldiers left behind by Genghis Khan in the 13th century, with considerable Turkish admixture. 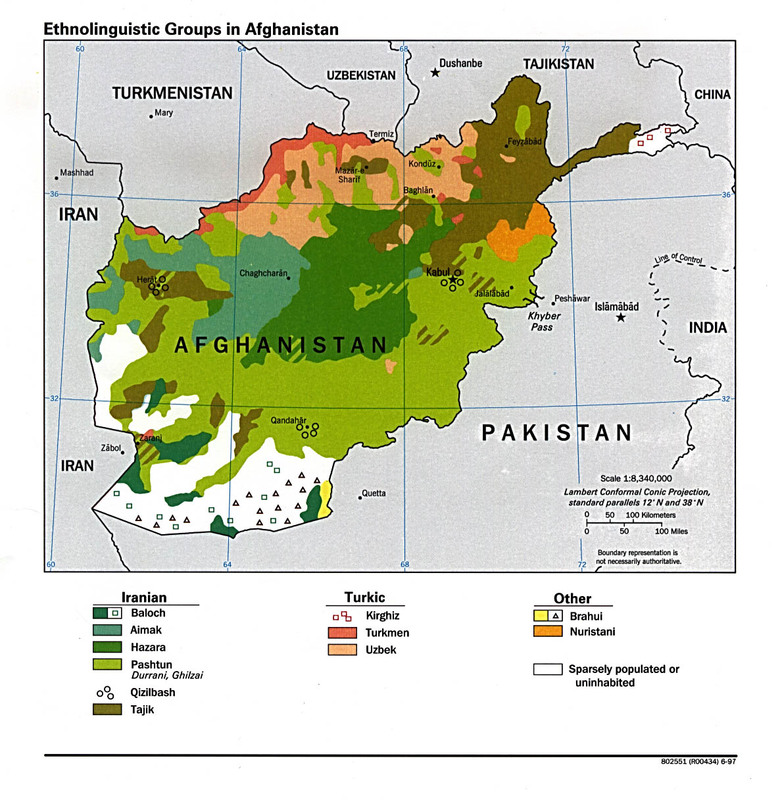 Their unwritten dialect, Hazaragi, contains regional languages - Arabic, Urdu, Mongol, Turkish and Dari/Farsi, which is now Afghanistan's primary language. 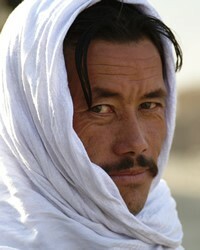 Prior to the 19th century, Hazara were 67% of the total population, the largest Afghan ethnic group. More than half were massacred in 1893 when their autonomy was lost as a result of political action. Later fundamentalist governments, including the Taliban, attempted to dismiss them historically, politically and culturally by labeling them a mere religious entity and continued to attack them until they were driven from power. Now, estimates number the Afghan Hazara at around 2.9 million, less than 10% of the country's population according to the UN. During the 1978-2001 war years numerous Hazara fled with other Afghans to Pakistan or Iran. While many returning refugees settled in Kabul to work as laborers, market vendors or in service positions, a majority returned to their mountain homelands. Comprised of a half-dozen tribes, the Hazara identify by village location more than by family ties. Marriage is arranged for a price - usually for the groom's economic advantage - and the bride joins her husband's family. Semi-nomadic life is simple and harsh in this arid region which is dependant on October to April snows to water meager grain crops and herds. Sustained drought is not uncommon. Housing varies by location and season. In valleys, shelters are sun-dried bricks plastered with a mud/straw mixture; at higher elevations, homes are stone with timber roofs; in summer tents are used as flocks move to high meadow pastures. Food is barely adequate, consisting of bread, possibly vegetables and dairy products like buttermilk, yogurt and hard cheese. Rice and tea are obtained by barter. In dry years malnutrition and starvation are common. Health issues are serious, aggravated by geographical isolation, unsanitary conditions and little access to medical care, which is only available at far distances by foot or donkey. Tuberculosis, leprosy, dysentery and eye disease caused by dust storms and smoky living quarters often go untreated. A talented people, the Hazara truly enjoy poetry, often memorizing it and using it to teach children, as well as storytelling and music that is distinct to their culture. They are expert rug weavers, embroiderers and calligraphers (even through most are illiterate). Wrestling and a baseball-like game are favorite physical pastimes. Hazara women are honored in legend and folk tales. Shunning burkas, their traditional garb is bright green and red floral dresses, worn without the long under-trousers customary in Afghan culture and accessorized with heavy stockings, fur-lined boots, beaded headgear and heavy, coin strung necklaces. Independent and industrious given opportunity, many pre-Taliban Hazara women were highly educated and entered teaching or medical professions as well as serving in political roles. And, unlike other Afghan women, they fought beside Hazara men in battle. Adjectives often used to describe the Hazara include brave, hardworking, trustworthy, friendly and committed. Known, too, as superb soldiers, today they proudly fight for equal rights, peace and Afghan unity, hopeful of a kinder future for their children. The Hazara are Muslims (mostly Imami Shi'ite, otherwise known as "Twelvers", who hold a particular reverence for the son-in-law of the prophet Mohammed). A number of Hazara who have strong ties with the Tajik people are Ismaili Shi'ites (also known as "Seveners"). Strong feelings prevail between the two sects, each one often denying they have any ethnic affinity with the other at all. The Hazara are in urgent need of basic health care and clean water. Illiteracy is high. Adequate educational opportunities need to be provided for both boys and girls. There are opportunities for missions work, but those involved (mainly medical and humanitarian in nature) are doing so under extreme difficulties. There are no official missionaries working among the Hazara. Access to the Hazara's homelands is difficult in summer and virtually impossible in the winter. Christian converts are hesitant to meet with other believers for fear that a spy may be present among them. Christians turned in by government informants may face torture and even death unless they renounce their faith in Christ. * Ask the Lord to call people who are willing to share Christ with the Hazara and to help meet their physical needs. * Pray that God will call doctors and nurses, construction volunteers, and agriculturists to Afghanistan. * Pray that God will send Christian teachers and literacy workers who can minister to the Hazara. * Ask God to protect medical and benevolent workers in Afghanistan. * Pray that the Lord of the harvest will send forth laborers into the fields where the Hazara are located. * Ask the Lord to help you learn more about the Hazara and what you can do to reach out to them. * Pray that the Christians who live near and among the Hazara will be bold in sharing their faith in Jesus. * Pray for completion of Bible translation in this people group's primary language.View Hazara in all countries.